We invite you to explore India - the Land with infinite beauty ! Whether you soar high into Himalayas or peer under the ruins of the Ancient monuments dotting the landscape of India, you will cherish the experience long after your visit ! 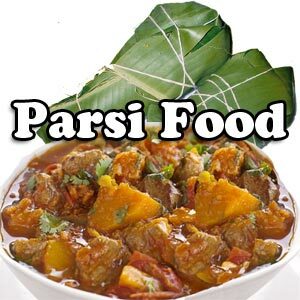 This India Travel Guide on Parsi Food Recipes is free from any commercial interest! This site is dedicated to promote India - the vast subcontinent, its glorious past, magnificent landscape and its infinite variety. The Parsis are fire worshippers and followers of Prophet Zarathustra. They moved into India about 1300 years back from Iran to escape religious persecution. They first entered into Gujarat and later Maharashtra. As the Parsis were well educated with strong business acumen, they flourished under the British rule. Influences of both Iran and India are noticed in Parsi cuisine. A typical example of this would be a Parsi curry which combines nuts from Iran and coconut and spices from India. They also adapted to western food styles due to the British influence. Egg is an all time favorite in Parsi cooking. Little wonder that they end up having eggs in many combinations; be it eggs on tomato, eggs on kheema and eggs on potatoes. Simmering meat, daals, and vegetables in a single pot are intrinsic to Parsi cooking. A typical example of this is umberiyu which is a cauldron of meat, papri, brinjals and Bombay duck. Other Parsi favorites include fried eggs set in a thin layer of potatoes and tomato, kid gosht and lagan nu custard. Succulent kababs and chicken cutlets are big favorites. Other Parsi meat specialties are Jardaloo ma Ghost (meat cooked with figs), Masoor ma gosht (Meat and lentil combination), Boti papeta (Meat and Potatoes) and Kheemo. Popular Parsi snacks include toddy-laced bhakras, kolah pickles, sweet mango ambakalaio, mustard and mango baffena and suterfeni, sugary flour strands flavored with rose petals and nuts. The Akuri is a traditional Parsi breakfast meal. Made with eggs and onions and tomatoes with plenty of spices, the Akuri is much like an egg bhurji. Chapat or sweet pancakes, Ravo and Falooda are favorite Parsi sweets. Nankhatai, sev and Dudh na puff are eaten as snacks. A typical Parsi wedding feast is served on a banana leaf. It is a sit-down feast though nowadays many wedding diners are served buffet style. The traditional tangy ‘lagan nu achar’ is served first. It is served along with Saarya, a thick papad. Fish is served next - either fried fish or machi nu saas or patra ni machi. The patra ni machi is a Parsi delicacy where succulent pieces of fish are marinated and slathered with green chutney and steamed in banana leaves. Sali Chicken or chicken curry and fried potato straws come next. In some cases, Chicken Farcha or deep fried chicken in masala and egg batter finds place in the wedding feast. Rotis are eaten with these gravies. A meat dish like Kid Gosht or Lagan nu stew is also likely to be on the lagan nu bhonu. You can find a simple salad or kachumber; a medley of chopped onions, cucumber, tomatoes, and green chilies doused with salt and vinegar dressing. Dhansak is not traditionally served at weddings. Instead you have Pulao daal, a heady concoction of basmati rice, potato and meat. The dessert is usually Lagan nu custard, Cassata or Kulfi. Cook the dals along with chopped vegetables and meat pieces. Remove the meat pieces and potatoes from the dals and vegetables. Blend the dals and vegetables. Heat oil and fry the chopped onions till brown. Add the ground masala and bay leaves till aromatic. Now add tomatoes and coriander leaves. Add salt and turmeric powder and continue to sauté for another 2 minutes. Then add the meat and potato pieces. Cook for a while and add dal. Grind mint, coriander leaves, grated coconut, chillies, garlic, sugar, onion, cumin seeds and salt to fine paste. Clean the fish carefully and slice each pomfret into 4 pieces. Make wrappers out of banana leaves by cutting them into large rectangles. Slather the green chutney onto the fish pieces and sprinkle a little lemon juice. Each fish must be individually placed and wrapped in banana leaf packets tied with string. Grease a baking tin and place fish in it carefully. Put a little ghee on the banana leaves and bake on both sides for 15 minutes. Grind red chilies, garlic, turmeric, cumin seeds and 1 sliced onion. In a large pan, heat ghee and add 1 sliced onion and fry till golden brown. Add ground paste and cook for 5 minutes. Add prawns and stir well and add chopped onion, coriander leaves and salt to taste. Add ¼ cup water and allow prawns to simmer. When prawns are cooked, add tamarind extract and bit of jaggery. Clean spinach and wash leaves and chop. Heat the oil in a pan. Sauté onions, ginger, garlic, green chilies for a few minutes. Add turmeric powder and chili powder. Drop in the chopped spinach, salt and sugar and continue cooking on slow fire for a few minutes more till spinach is cooked. Separate eggs and beat whites of eggs till soft peaks form. Add yolks and blend. Put spinach in an 8 inch pie plate, spread beaten eggs over surface of spinach and bake in moderate in oven till eggs are set and golden. Soak rice for a few minutes and then completely drain the rice and keep aside. Heat the ghee in a deep heavy bottom pan on a medium flame. Sauté the onions till brown. Add the sugar and allow it to caramelize. Add the whole spices and fry till they release their aroma. Add the rice, salt and mix well. Stir to prevent sticking. Add the hot water and mix again, bring to a boil and then reduce heat. Turn off the fires, and allow to rest for about five minutes. Serve hot with Dhansak and Kachumbar salad. Essential Indian Spices - Boost your Health.